From the roadside in Glen Torridon, the long ridge of Beinn Eighe appears as a pleasant looking long ridge. However, this hides a spectacular North side, and in particular, "Triple Buttress" in Coire Mhic Fearchair, one of the finest corries in the country. Two very fine ski gullies are found here. Fuselage gully bounds the West side of "Triple Buttress", and Morrison's Gully splits the North face of Sàil Mhòr, allowing a huge descent prior to your walk back to the car. The best option for getting to Coire Mhic Fearchair must rank amongst one of the finest relatively low level walks in the country. Parking at the sizeable car park in Glen Torridon, follow the excellent path through Coire Dubh Mhòr, which is a pass between Liathach and Beinn Eighe, crossing the river at some stepping stones. As the path contours round the base of Sàil Mhòr, it splits at a cairn. Take the right hand one, which takes you to the head of Loch Coire Mhic Fearchair. The benefit of this approach is that you pass directly below Morrison's Gully, allowing you to check it out, and you get a view of what the situation is in the corrie. 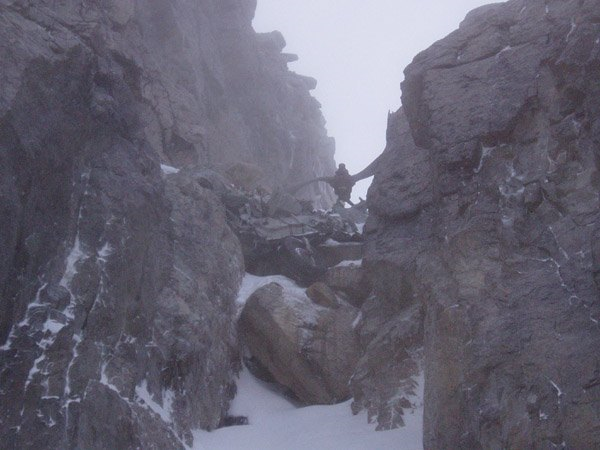 If you are planning on Fuselage Gully, approaching from below allows you to evaluate how lean the gully is, particularly at the wreckage of the bomber. To get to the bottom of the gully, take the slightly longer, but much easier, Eastern shore of the loch, where there is a faint path. It's easily possible to link up a descent of Fuselage Gully, followed by a descent of Morrison's Gully. To do this, once you have ascended and descended Fuselage Gully, cut up and into the shallow corrie towards Sàil Mhòr and gain the ridge (assuming safe snow conditions). The impressive East face of Sàil Mhòr has 2 obvious gully lines. When standing at the loch, White's Gully is on the left, and Lawson, Ling and Glovers route is on the right. Both end in cul-de-sacs, but the lower sections look like they would be nice descents. The gully below the col between Ruadh-stac Mhòr and Còinneach Mhòr is often rocky at the top, but does sometimes fill in and looks like it would be a nice descent in these conditons. It is a popular ascent and descent line for walkers to/from the main summit. On the west face of Ruadh-stac Mhòr above the loch, there are several shallow runnels that would offer good long descents in the right conditions. Away from Coire Mhic Fearchair, there look like some interesting descents from Spidean Coire nan Clach. There is one relevant Scottish Avalanche Information Service forecast for Beinn Eighe. Fuselage Gully, or Far West Gully as it is also know as, bounds the West side of Triple Buttress. It is a popular ascent and descent route for climbers in it's own right, but is also used to access the harder routes on West Buttress. It is unusual in that there are remains of a Lancaster Bomber in the gully, which crashed into the slopes above in 1951, killing all those aboard. When you see other bits of wreckage higher up, you realise just how close they were to clearing the top of the hill. Following the accident, some of the wreckage was pushed into the gully, and a section of it came to rest at a narrow point in the gully, about two-thirds of the way up from the bend. A propeller is the most distinguishable element of it. Despite the sad history (see links below), Fuselage Gully is a fantastic ski in the right conditions. Although never very steep, it requires care for a successful descent. The top of the gully is a wide open bowl, and people have been caught in avalanches in the gully in the wrong conditions. Be very careful to ensure that you descend the correct gully. The top of West Buttress forms a snow arete that separates Fuselage Gully (on skiers left) with West Central Gully (on skiers right). Do not ski into West Central Gully - there is a 70m high overhanging step in the gully which will ruin your day! Fuselage Gully has a low cairn at the top of it (skiers left), and a few meters below the top on the left hand side of the bowl, some plane wreckage may be visible when not covered in snow. When skiing from the top, it only takes a few turns down a narrow section before you are above the propeller. Unless the debris is completely banked up, a short abseil, or easy downclimb will be required by most. If abseiling, the propeller is a useful anchor. Below the wreckage, the skiing is easier, with no nasty surprises. The outlook is superb. In the upper gully, there is a fine view of Beinn Dearg and Beinn Alligin. As the gully swings round to the right, you are presented with a view out the mouth of the corrie. Notes: Grade I if the airplane wreckage is banked up. Grade II (or harder) if not. When passing below the foot of the Northern end of the barrel shaped Sàil Mhòr, a deep wide corridor splits the cliff. This impressive gash in the mountain is Morrison's Gully. It is clearly marked on the OS 1:50000 maps as a straight gully feature, starting slightly below and to the West of the summit of the hill. It is easier, and arguably, better than Fuselage Gully, with no need for any abseils. This one should be on everyones list! The upper reaches of the gully is a wide bowl, split by a shallow ridge. In descent, stay left of the ridge and follow the natural line as it cuts back below the ridge, and you'll find yourself in fine gully scenery, with a superb outlook. There may be some large boulders visible in the gully, but with reasonable snow cover, you will be able to ski through them. At the mouth of the gully, you should be able to follow a snow runnel on skiers right to get some extra descent done when lean.